An optical chip uses light instead of electricity to process information and can act as a quantum computer when using individual particles known as photons. Data from the chip enable frame-by-frame reconstruction of atomic motions to create a virtual film of the quantum vibrations of a molecule. This is the core of the study published today in Nature . 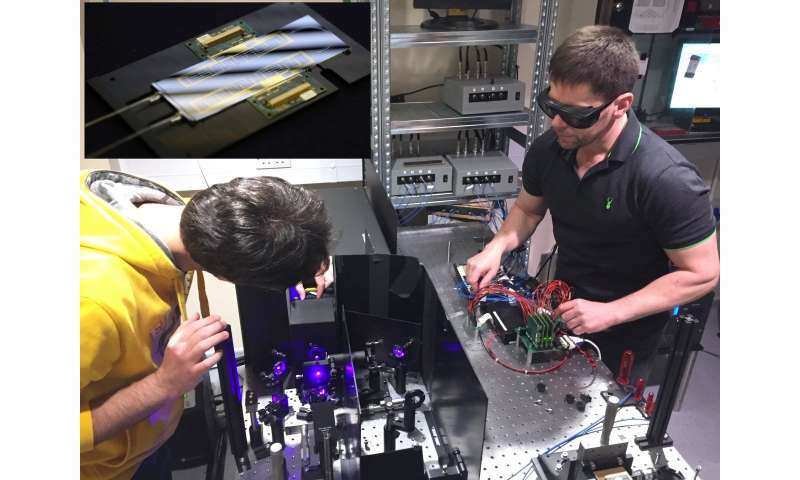 The Quantum Engineering and Technology Labs in Bristol have developed the use of optical chips to control single photons as basic circuits for quantum computers. Quantum computers are expected to be exponentially faster in solving certain problems than traditional supercomputers. However, building a quantum computer is a highly challenging long-term goal. As reported in Nature the team demonstrated a new route to molecular modeling that could be an early application of photonic quantum technologies. The new methods exploit a similarity between the vibrations of atoms in molecules and photons of light in optical chips. 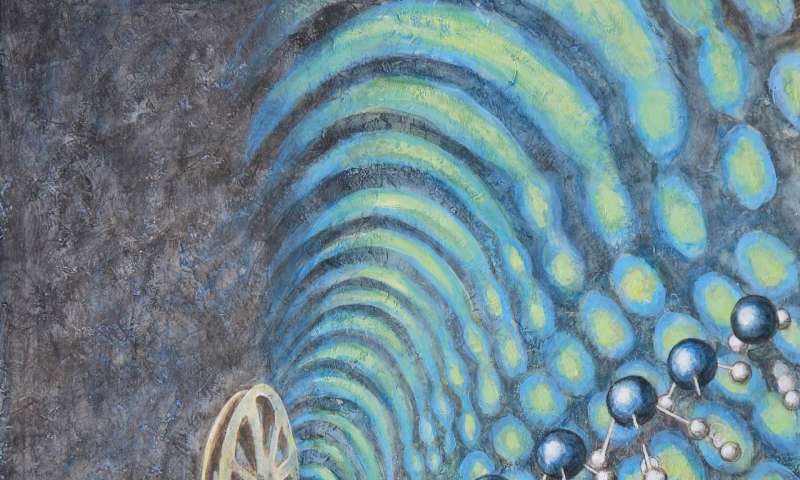 The Bristol physicist Anthony Laing, who led the project, said, "We can think of the atoms in molecules as connected by springs, and all over the molecule, the connected atoms vibrate like a complicated dance routine." At a quantum level, the energy of the dance goes through well-defined levels up or down as if the beat of the music were one step higher or lower, each notch representing a quantum of vibration. "Light comes too in quantized packets called photons. Mathematically, a quantum of light is like a quantum of molecular vibration. With integrated chips we can control the behavior of photons very precisely. We can program a photonic chip that mimics the vibrations of a molecule. "We program the chip by mapping its components to the structure of a particular molecule, such as ammonia, and then simulating how a particular vibration pattern evolves over a period of time." By taking many time intervals, we essentially build one Film on molecular dynamics. " The first author Chris Sparrow, who was involved in the project, talked about the versatility of the simulator: "The chip can be reprogrammed in a few seconds to simulate different molecules in which we simulated the dynamics of ammonia and some formaldehyde and We have simulated a water molecule that achieves thermal equilibrium with its environment and energy transport in a protein fragment. "Because time is a controllable parameter in this type of simulation, we can immediately turn to the most interesting points of the movie jump. Or play the simulation in slow motion. We can even rewind the simulation to understand the origins of a particular vibration pattern. " Joint lead author, Dr. Enrique Martín-Lopez, now senior researcher at Nokia Bell Labs, added," We also demonstrated how a machine learning algorithm can identify the type of vibration that best breaks up an ammonia molecule. A key feature of the photonic simulator that enables this is the tracking of the energy that moves through the molecule, from one localized vibration to another. The development of these quantum simulation techniques continues to have a clear industrial relevance. " Dr. Laing explained the main directions for the future of research:" Scaling the simulators to a size where they are superior to conventional ones Computing methods may likely require error correction or error mitigation techniques. And we want to further develop the complexity of the molecular model we use as a program for the simulator. Part of this study was to demonstrate techniques that go beyond the standard harmonics of molecular dynamics. We need to push these methods to increase the accuracy of our models in the real world. "This quantum simulation approach uses analogies between photonics and molecular vibrations as a starting point, giving us a head start to perform interesting simulations, and hopefully we can realize quantum simulation and modeling tools in the coming years offer a practical advantage. "